Charles yet again has provided some great information and given a lot of ideas about how dentists can keep an eye on what their competition is doing and how they can monitor and manage their reputation online. 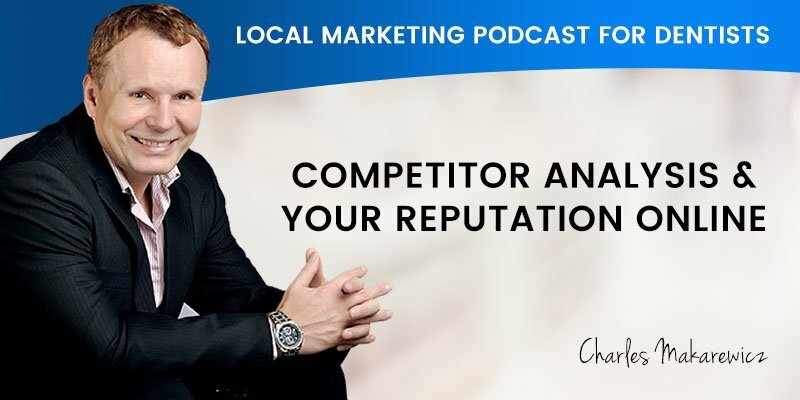 Scott: Am Scott Edwards and today I have Charles with me to discuss competitor analysis and managing your reputation online and how both from an integral part of your local marketing strategy blueprint. Charles is a founder of Dental Marketing Expert, a company which specializes in local marketing for Australian dentists and is responsible for many dental practices across Australia dominating the local competition at attracting up to 15 new patients each and every week. Welcome to the show Charles. Scott: Charles, when we talk about competitive analysis in the online sense, what exactly are we referring to? Charles: This is very simple. Every dentist knows that they have a competitor, most of them do, where they are. So you simply might have someone in the same building, you might have another dentist just across the road. How we look at the competitor is, we simply use their suburb. So whatever suburb you’re in we’ll look at all the dentists under that suburb so for example if you’re in Kew we will run the search in Google under “dentist Kew” and we’ll have some results. So those results that pretty much all of them are your competitors as long as they are in that suburb. So that’s the first qualifier. So we will look at it and we pick the first top 10 competitors from that suburb and we plugin into software. We use specific software which generates analysis for us and we look at various aspects. I’ll pull up the screen of the results and are going to run it through. Google my business results…. What we have is it tells us if the listing was verified and how many citations you have and how many citations directory your competitors have. It tells you top citations. So the ones which are the most important with the high quality and high ranking directories are called top citations and that tells you the percentage and the top citations and then number of links and linking domains, and website authority. That’s important because obviously it’s not just how many links you’ve got but also how high authorities of the website which is linking to you and there’s few others, majestic see flow etc . It’s simply a snapshot of your competitors in various areas from citations to links to things like that to reviews. We can just look at it and say, okay great, there’s a lot more work needs to be done in building more citations or the there is more work needs to be done in regards of the reviews because your competitors got 20 reviews and you’ve got maybe five, so you’ve got a lot more catching up to do. Scott: Obviously Charles you used proprietary software to perform these searches, but is there anything a dentist can perform analysing himself against his competition? Charles: Definitely. This is actually a fantastic question Scott. This is what our team do in step two. So the software is great. It gives you a really great overview of 10 competitors but what we need is another layer. So another layer is you find the top competitor number just one at the time. You simply type their name in the search and you look what’s coming up on perhaps up to 10 or 15 pages deep and that gives you a really good spectrum of the websites popping up and there’ll be citation directories there’ll be social media site, there’ll be a video sites. Now you need to open them all the ones you think which are good quality and review it and if you don’t have a link, if you don’t have a strategy, if you don’t have perhaps a video on Vimeo, if you don’t have something where your competitor does well you need one. 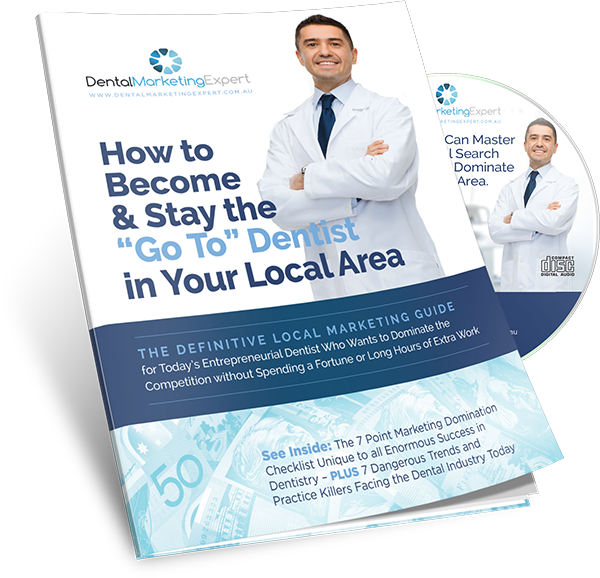 So anyone from your dental office can actually perform that can perform search for your competitor one by one. It’s a bit more time consuming. You simply just have to go through that and keep on opening all those links and comparing to your own site. You can actually do the search for yourself so you can open two windows you search the competitor and yourself. If you can’t find that specific listing, most likely you should know if there will be something there or not but generally you can very quickly compare it. You can run the search on the specific platform for your own name and if Yelp comes up and you search Yelp for your name. If it doesn’t find you, you don’t have that listing on the Yel. Directory listings are little easier because that’s what they are designed for that they help you to search for a business. Scott: So it was what you’re saying Charles, as long as we are one step ahead of our nearest competitor online, we should be on top and therefore that should be reflected in our ranking. Charles: Yes that’s correct. It is a simple … Google algorithm looks at 200 plus factors, especially for the Google maps results, and one of those factors are number of citation directories and their accuracy and that’s your links you seeing when you type your name in search and all the links coming on the page, a lot of them are citation directories, so all those are visible for your competitors and if you can mimic them and not just from one, imagine if you can mimic it from all your main competitors, then you will improve your positioning online. As we talk about the having the report analysis using dedicated software, one of the things we looked at was reviews from different platforms. Now, the most important reviews are on Google maps and no one can take away this from you. So I don’t necessarily like building reputation marketing around platform which can turn this off. Unfortunately that includes Facebook. Facebook reviews can be turned on and off, so ideally that should be yes could be part of your mix but not primary focus. Your primary focus should be on Google my business reviews and you also have a TrueLocal in Australia which is quite a good directory to have reviews on. There is Yelp and even Yellow Pages allows you to leave reviews. Now, we have internally created reputation marketing blueprint which explain everything, what you should be doing in regards of the reviews. We know as a fact that Google Maps will rank you based on the number of reviews. Not necessarily positive or negative. It’s more to do with the review itself and where the reviews are coming from. So obviously you don’t want to see reviews coming from oversees when your local business is in Australia. So if someone’s posting a review from there, that’s really not a good idea. The best reviews are from your patients who live in your target area. Google can track your IP address or can track your location if you’re using your phone and that is something you need to remember. So the local reviews are the best because they actually helped to expand your area. So if you’re targeting surrounding suburbs and there’s a lot of reviews are left from surrounding suburbs that actually expands your area for ranking for additional suburb keywords. Let’s talk a little on the regulators in Australia. They’re very strict and obviously by now, most dentists know that you’re not allowed to have testimonials on your website. Please go and check your website, check all your pages and make sure there’s no testimonials on your website. Now the case studies becoming little tricky as well so I’ll be basically educating myself in this area. There’s some good links on the Australian Dental Association website and other related website where you can read more and educate yourself because this is critical, this is changing all the time so when you might be watching this podcast in the next few months and the regulation might have changed. So I don’t want to cover every single point right now because it might not be current but you just have to be aware that you have to study it and you have to be aware of the really strict regulators in regards of the testimonials, in regards of before and after photos and also to some degree reviews. So In a way that’s a platform where you want to see the reviews and see a lot of positive reviews there. Now if patient ever asked you about it, normally the review should never talk about procedures, never say you specialise in a certain area. If anyone leaves the review, ideally just talk about how pleasant the receptionist was, how beautiful your waiting area and you perhaps offered a bottle of water, so how wonderful that was and perhaps the procedure was very gentle and they felt fantastic, and didn’t even notice that they were at the dentist. And then perhaps mentioning I’m from Carrara and it is easy for me to get to this location, It’s just across the school or something like that, Central location so it gives this additional location information to Google as well. This covers the reviews in a nutshell. I don’t want to go too deeply in that area because I said it’s really regulated. You don’t want to necessarily display reviews on your website and have that. Testimonials are definitely not allowed, the reviews are a little tricky. I recommend to stay low profile, you don’t really need to offend the regulators in this area but do not ignore it and watch your competitors what they’re doing in this area and if they’re having a lot of reviews and you don’t, that will be a huge disadvantage to you. Also, I’ve a number of clients asking me if they should sign up with a reputation marketing companies in US. My answer is no. The reason is, the regulators don’t like that. Australian regulators don’t like you putting a script on your website with a soliciting their reviews. So I will stay away from it and if you have something on your website, perhaps you need to consider removing it and as I said again, just keep a low profile, no one said that you can’t have those reviews on Google and no one can remove it. So that should be your long-term goal. Let’s not forget about the reputation itself starts from being a really good dentist. If we look at overall reputation online, some of the dentists getting very low stars and lot of bad feedback so perhaps it has some merits so the most important part of that is for you is to learn it and to understand that you need to be a good dentist and the same way your whole dental practice need to run that way. The receptionist need to be fabulous with older patients and you need to set up the systems for it. So if you think about the reputation itself, the reputation online, is the feedback system. So if you have something going wrong in your dental practice, you could probably going to see this online. It’s going to come back so one of our systems is to monitor it, to have a look at every single review and see how you going with the reviews online. If there’s someone actually left the review and perhaps you need to make a comment,… try to talk to them if the review wasn’t as good as you think it should be. So monitoring that, managing that reputation is the critical part. So to summarise that, the reputation online should not be ignored because if your reputation goes down, if you go from five star to four star, your conversion goes down to half and that could cost you thousands and thousands of dollars in the new patient acquisitions. So it’s important. Let’s not neglect it. Let’s watch that reputations and make sure that it’s five star right now and remains five star long-term. Scott: Charles yet again you’ve provided some great information and given a lot of great ideas about how dentists can keep an eye on what their competition is doing and how you can monitor and manage your online reputation online. Let wraps up today’s podcast folks. Stay tuned for our next episode, when we discuss tracking and measuring return on investment for your overall local marketing strategy. Until next time, bye for now.